Palm Olein, coconut oil and palm kernel oil are edible plant oils derived from the fruits of palm trees. Palm oil is extracted from the pulp of the fruit of the oil palm Elaeis guineensis. 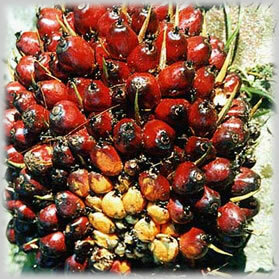 Palm Olein is naturally reddish in color because it contains a high amount of beta-carotene. Palm Olein is one of the few highly saturated vegetable fats. Palm oil is semi-solid at room temperatures. Palm Olein contains several saturated and unsaturated fats. Like all vegetable oils, palm oil does not contain cholesterol. Its increasing use in the commercial food industry in other parts of the world is buoyed by its lower cost and the high oxidative stability (saturation) of the refined product when used for frying.